After being released from his mountain prison in chapter fourteen, Sun Wukong effortlessly kills a tiger with his iron staff and uses a magic hair-turned-knife to skin the beast. He cuts a large square from the fur and uses half to create a loincloth to cover his naked body (Wu & Yu (Vol. 1), 2012, pp. 309-310). 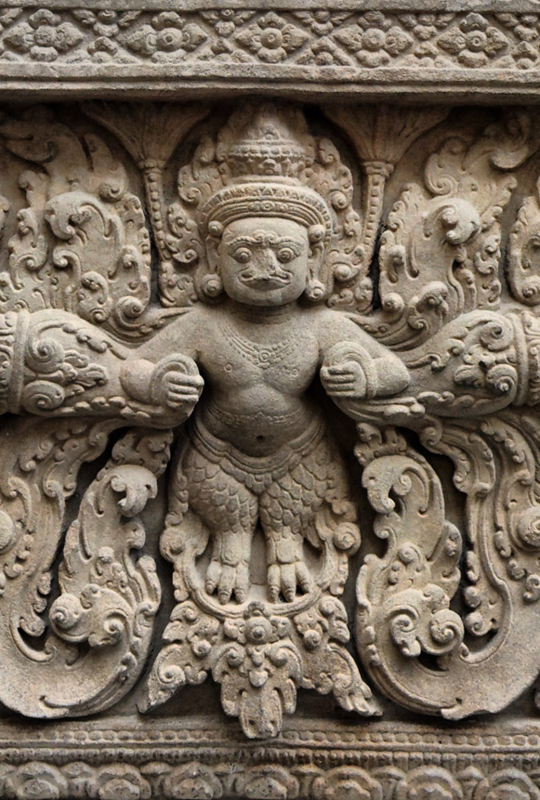 This tiger skin clothing is a highly recognizable element of Monkey’s iconography (fig. 1). But did you know it has a connection to the Wrathful Destroyers of Obstacles (Sanskrit: krodha-vighnantaka),  a class of supreme guardian deities in Indo-Tibetan Esoteric Buddhism? Before I continue, some historical background is needed. 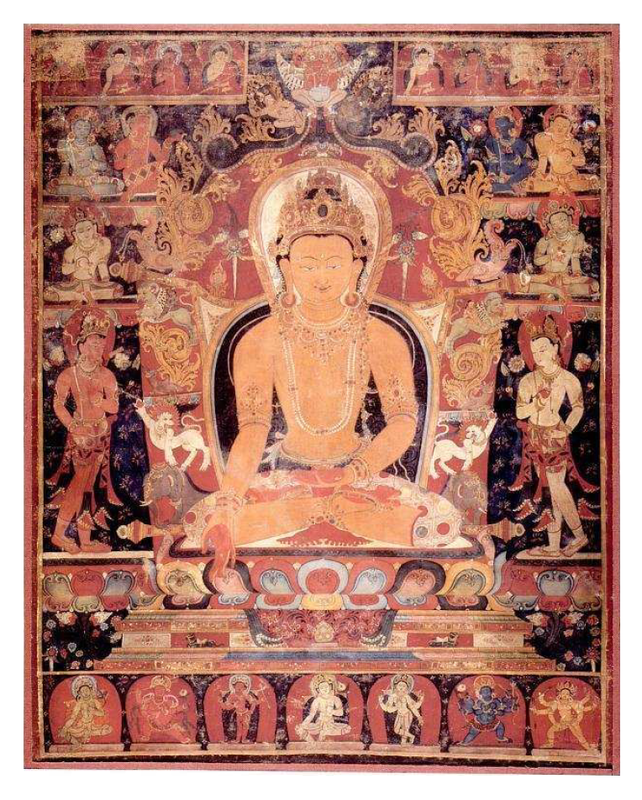 Esoteric Buddhism first developed in India as an offshoot of Mahayana Buddhism during the sixth-century CE. 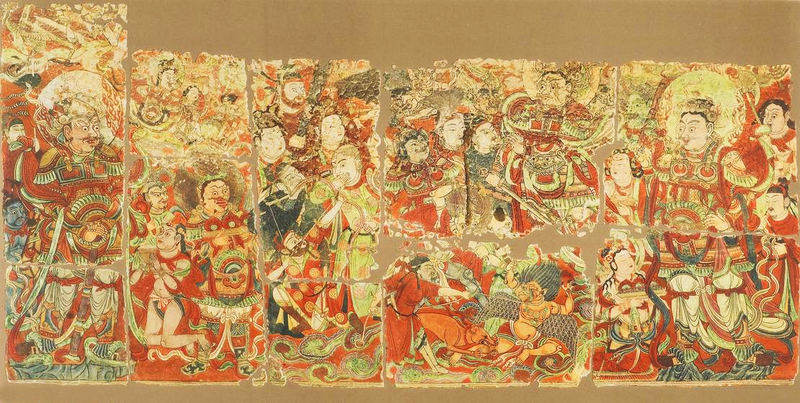 Wrathful Destroyers of Obstacles (WDO, hereafter) appear in three recognized iconographic phases stretching from the sixth to the twelfth-century. 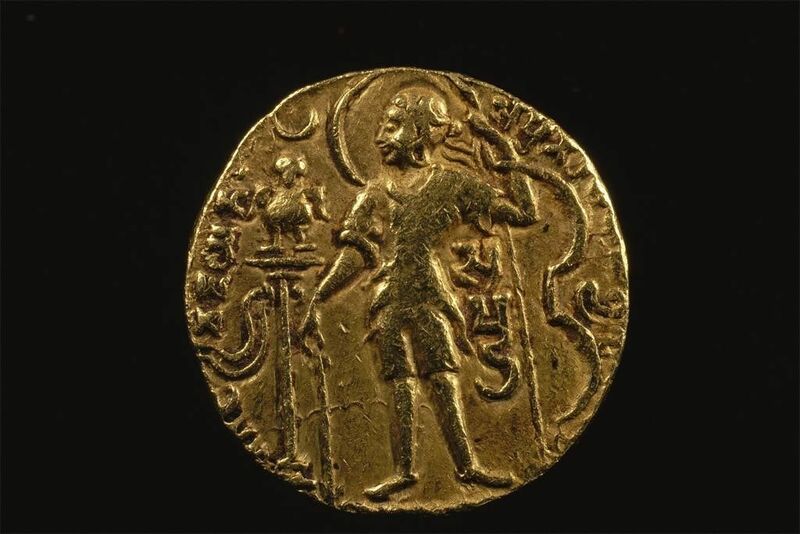 The first and longest phase (6th-12th cent.) 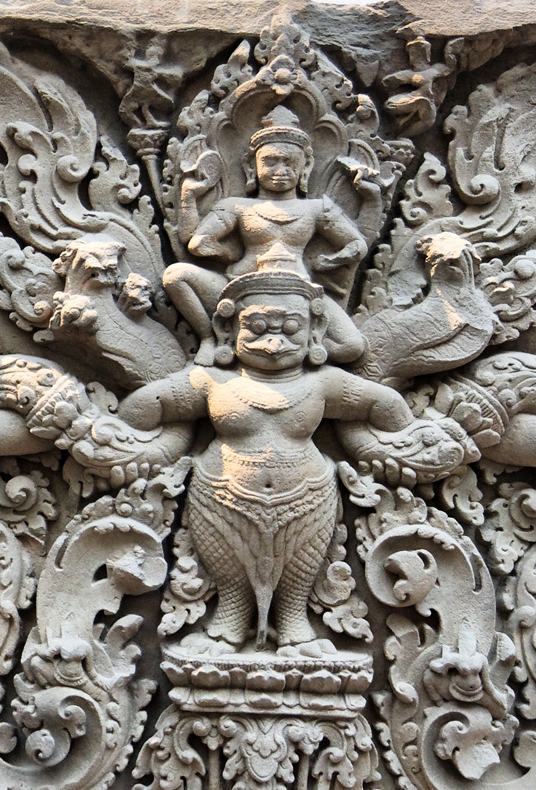 depicts the WDO as a dwarfish attendant to a full-size Bodhisattva. He serves as the personification of his master’s wisdom and abilities. The second phase (8th-10 cent.) represents the WDO as an independent deity with his own attendants. 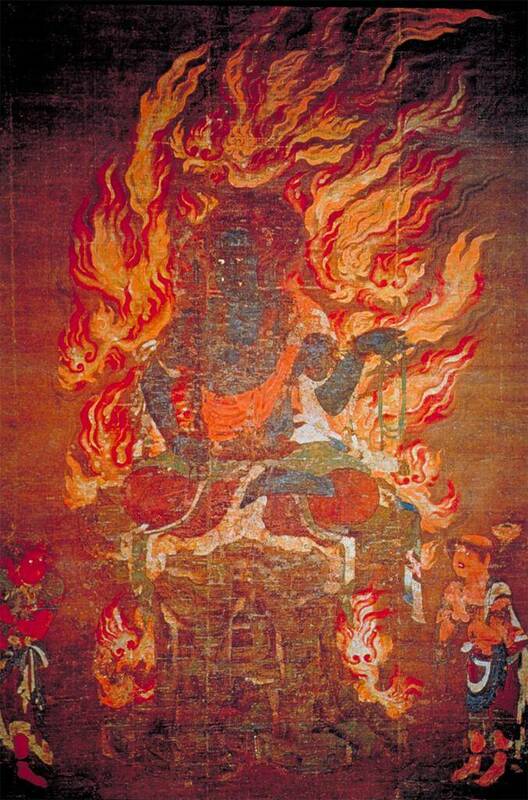 He serves as the personification of the attributes of the five esoteric Buddhas. The third phase (late 10th-12th cent.) 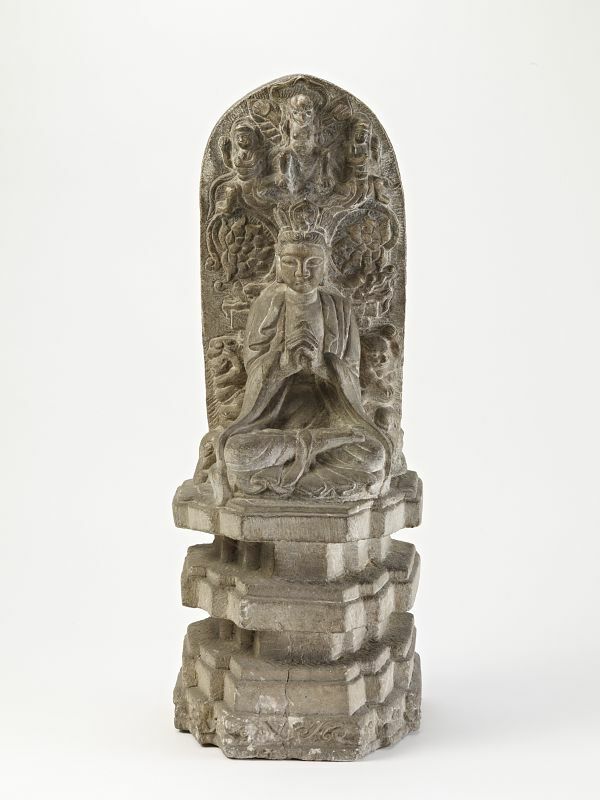 represents the WDO as the equal of Buddhas (Linrothe, 1999, pp. 11-14). The scholar Van Kooij comments, “Heruka is more or less a deified hypostasis of the … yogin himself” (Linrothe, 1999, p. 251). This suggests the WDO are dressed according to what is worn by the very Yogin ascetics who worship them. But I would like to take this one step further. 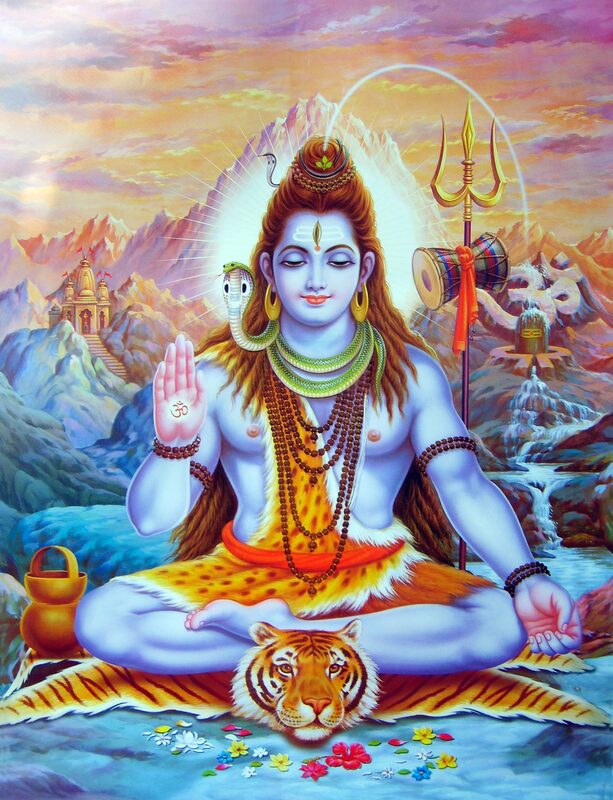 It is important to note that many of these elements, such as the earrings, bracelets, arm bangles, bone necklace, tiger skin dress, khatvanga staff, drum, and dancing, are all attributes of the Hindu God Shiva. He is considered the yogin par excellence, as well as a wrathful deity in his own right (Elgood, 1999, pp. 44-54). I therefore suggest the practice of wearing tiger skin was just one of many elements that esoteric Buddhism borrowed from Hindu asceticism. Fig. 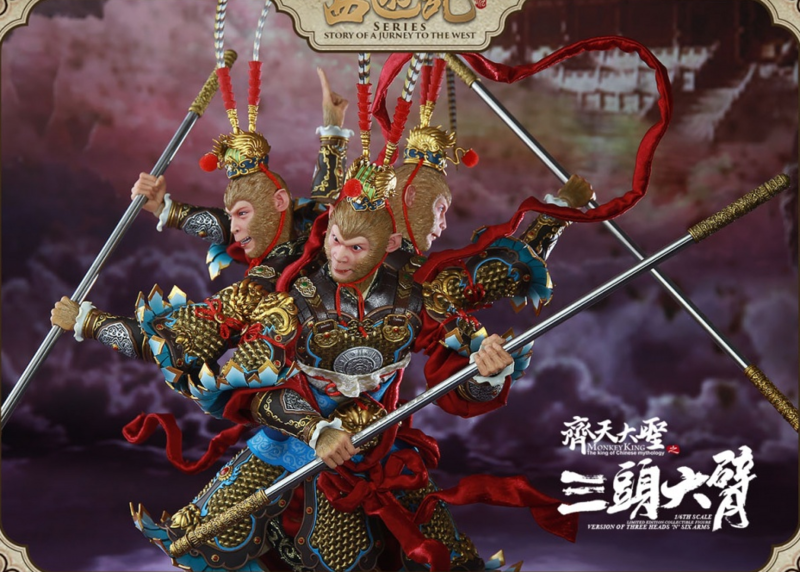 1 – (Left) A modern depiction of Sun Wukong (by the author) (larger version). Fig. 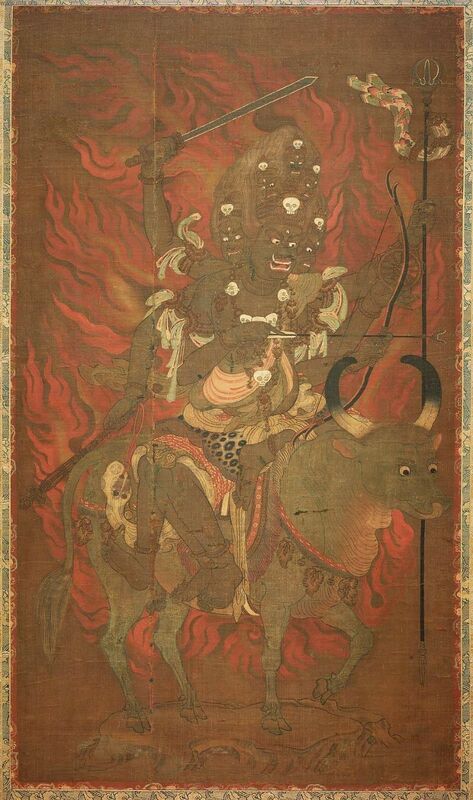 2 – (Center) A 13th-century Japanese depiction of the Wrathful Destroyer of Obstacles Yamantaka (larger version). Fig. 3 – (Right) A modern depiction of the Hindu god Shiva (larger version). 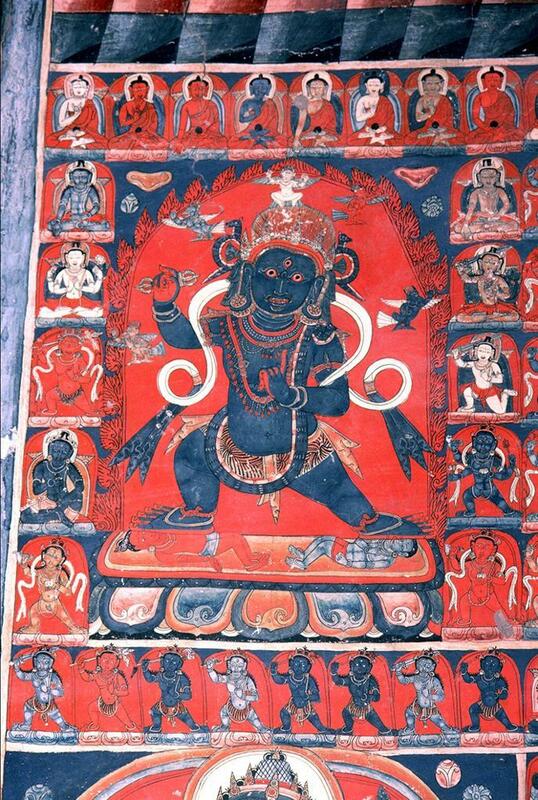 Shiva is often depicted as wearing a tiger skin and/or using it as a meditation mat (Skt: Asana) (fig. 3). This skin has two interpretations: first, it represents his power over nature; or second, it represents him killing the personified “tiger of desire” (Elgood, 1999, p. 52; Beer, 2003, p. 65). When viewed from a Buddhist context, it seems only natural that Buddhist ascetics and deities would use the skin to represent the cessation of desire. It should also be noted that tigers and their skin were symbols of strength in ancient India. For instance, the great Hindu epic the Mahabharata (circa 4th-cent. BCE), describes the martial feats or attributes of many powerful warriors and kings as being tiger-like (Śarmā, 1988, p. 66). In addition, during the royal consecration ceremony (Skt: Rajasuya), newly appointed Vedic kings would step on a tiger skin to gain the animal’s strength (MacDonell & Keith, 1995, p. 337). I therefore suggest the WDO tiger skin loincloth serves a secondary function as a symbol of the WDOs spiritual or physical strength. 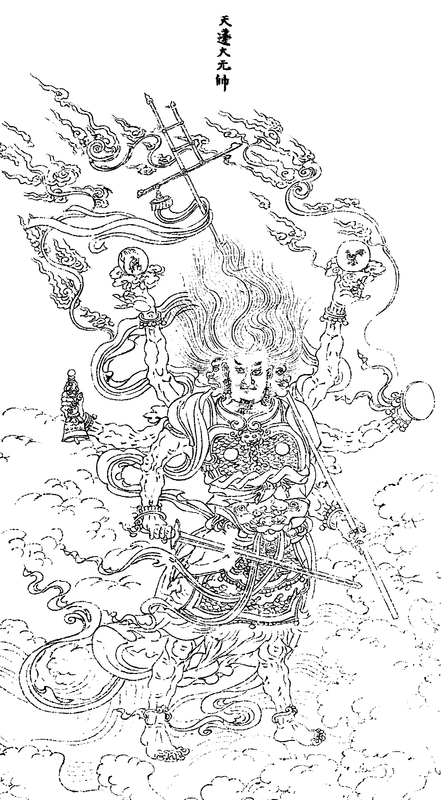 There are numerous classes of Buddhist deities that share similarities with the WDO, such as having a wrathful appearance and serving a protective function, but do not rank as high in the esoteric pantheon. 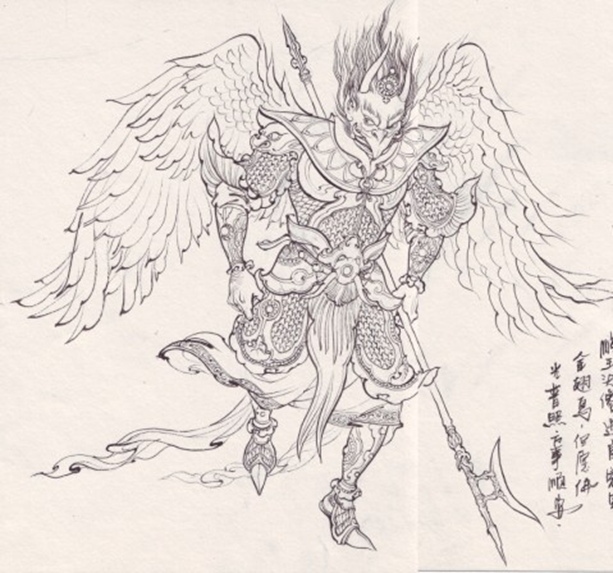 These include the Heavenly Kings (天王, tianwang; Skt: Lokapala) (fig. 4), who protect righteous kingdoms and monasteries; Gate Guardians (門神, Menshen; Skt: Dvarapala), who protect the doorways of monasteries and temples; the Protector of Fields (Skt: Ksetrapala), who protect plots of land; the Guardians of the Directions (Skt: Dikpala), former Hindu gods who protect the eight directions; and the Dharma Protectors (Skt: Dharmapala), who protect the Buddha’s teachings (Linrothe, 1999, pp. 20-22). Fig. 4 – (Left) Statues of the Four Heavenly Kings located in Beihai Park, Beijing, China (larger version). Fig. 5 – (Right) A modern toy depicting Monkey’s fearsome three-headed, six-armed form (larger version). 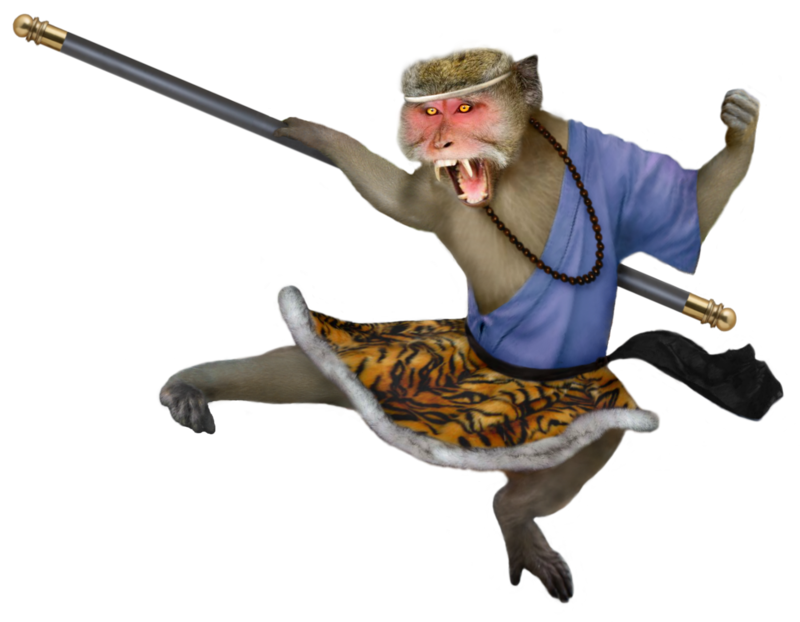 Many of Sun Wukong’s attributes and abilities align with those mentioned above, I would therefore like to argue that he is a Wrathful Destroyer of Obstacles. First, he wears the tiger skin loincloth, which ties him to the same spiritual tradition represented by WDOs and Yogin ascetics. Second, he has a wrathful appearance (Skt: krodha). During his war with heaven, he takes on a fearsome form with three heads and six arms and multiplies his iron staff to defeat wave after wave of celestial opponents (fig. 5) (Wu & Yu (Vol. 1), 2012, pp. 157 and 191). This is similar to the multiple heads, arms, and weapons of the WDO Yamantaka, as well as other such deities (Linrothe, 1999, pp. 188, 268-269, and 279-280, for example). 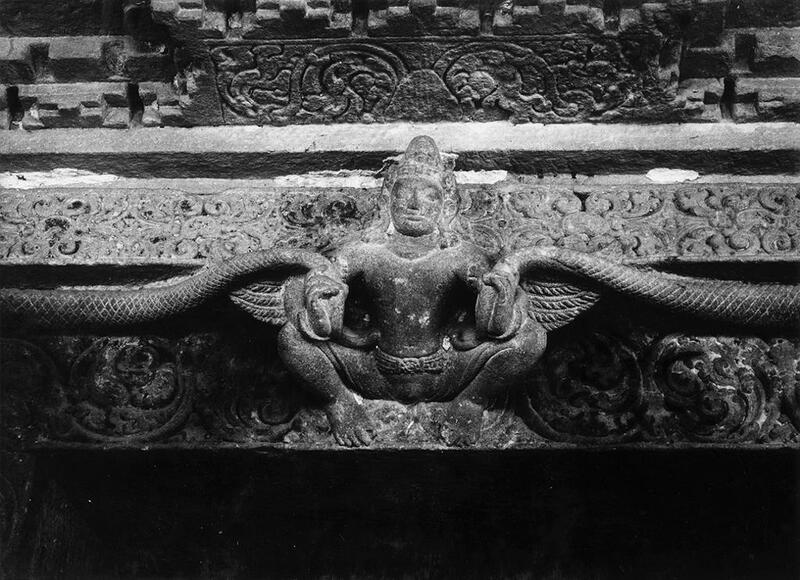 Third, he serves as a destroyer of obstacles (Skt: vighnantaka). 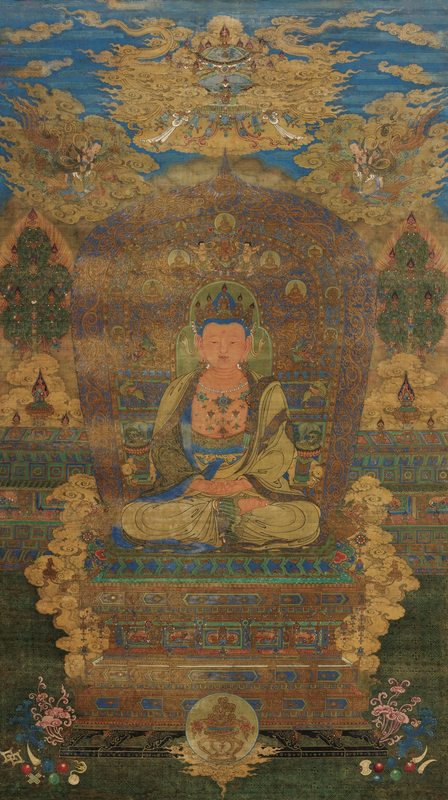 By vanquishing the various monsters, spirits, and fallen stars that threaten the life of his master Tripitaka, Sun clears the path of manifested demons that obstruct the monk’s path to enlightenment. Thanks to his help Tripitaka becomes an enlightened Buddha at the end of the novel (Wu & Yu (Vol. 4), 2012, p. 381). Fourth, Sun serves as the guardian and strong-arm of a Bodhisattva, per phase one of the recognized WDO iconography. Tripitaka is after all the Golden Cicada Bodhisattva reborn on earth. 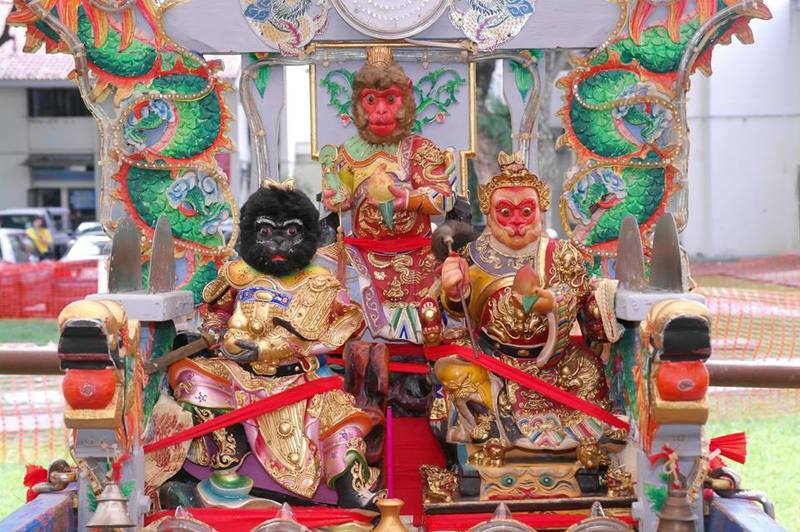 Fifth, Monkey is so powerful that he poses a threat to the August Jade Emperor of Heaven, just like the WDO Trailokyavijaya did for the supreme deva Mahesvara. This ultimately explains why the celestial army is no match for Sun and why other guardian deities, like the Heavenly Kings, fear and respect him. Identifying the Great Sage as a Wrathful Destroyer of Obstacles helps locate his position in the novel’s Buddhist pantheon prior to his elevation to Buddhahood. This means Monkey is no longer the Buddho-Daoist “wild card” that doesn’t really seem to fit in anywhere. 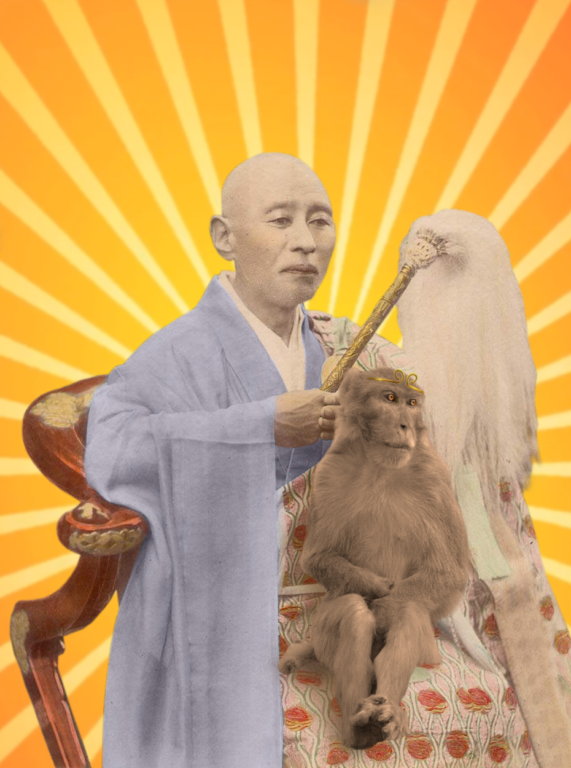 The author/compiler of Journey to the West would have had plenty of esoteric material to influence his depiction of Monkey. Esoteric Buddhism filtered into China by the early Tang Dynasty (618-907) and continued into the Song (960-1279) thanks to royal patronage. People of the neighboring foreign Khitan Liao (907-1125), Tangut Western Xia (1038-1227), and Jurchen Jin (1115–1234) dynasties, all of whom conquered northern China at one time or another, adopted the religion. 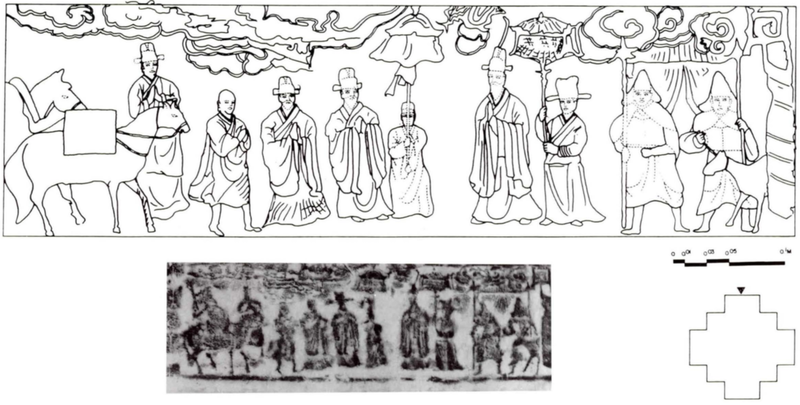 The Mongols, another foreign ruler of the Middle Kingdom, were great adherents of Vajrayana Buddhism during the Yuan Dynasty (1271–1368), which ensured the continued presence of esoteric imagery in China. And during the Ming (1368-1644), when Journey to the West was first published, the Yongle (r. 1402-1424) and Zhengde (r. 1505-1521) emperors, as well as other elite members of society, patronized and/or practiced the religion (Stoddard, 2008; Orzech, Sorensen, & Payne, 2011). 1) The krodha-vighnantaka term was coined by Rob Linrothe (1999) since the names traditionally given to said wrathful deities over the centuries are not appropriate to cover all three historical phases of their existence (pp. 19-20). 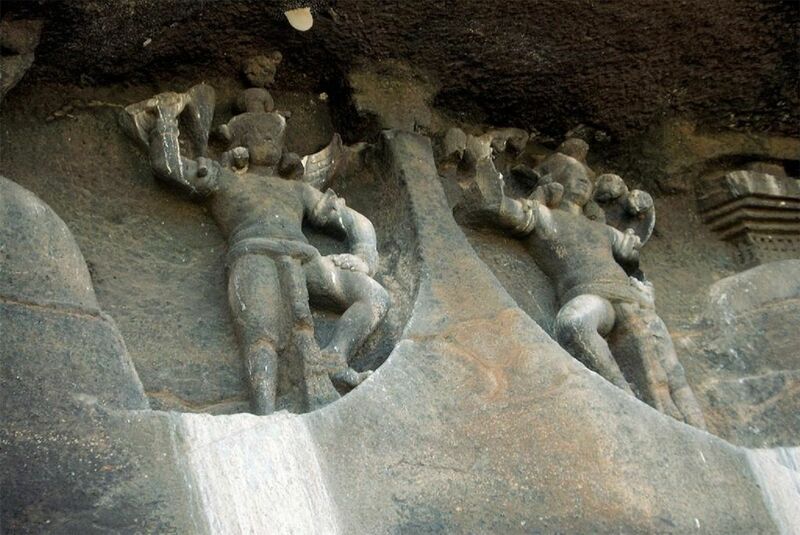 2) The first artists to represent WDOs drew on previous depictions of semi-divine Yaksa spirits, the dwarf-like Gana attendants of Shiva, and the humanoid personification of divine Hindu weapons (Skt: ayudhapurusa) (Linrothe, 1999, pp. 12-13). 3) The three poisons are stupidity, greed/lust, and anger. 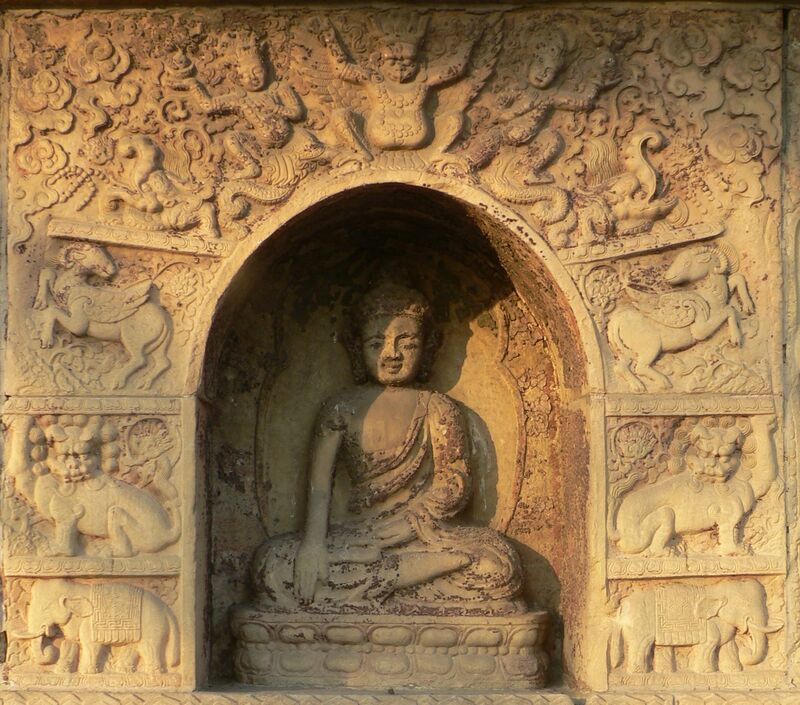 These are often depicted in the center of Buddhist Wheel of Life art as a boar, a snake, and a rooster, each biting the others tail, forming a circle. 4) Rob Linrothe (1999) writes that Shiva in this case represents the conquering of ego instead of “a Hinduism which must be humiliated” (p. 26). 5) During the Great Sage’s rebellion, the August Jade Emperor is forced to ask the Buddha to intervene because Sun Wukong is too strong (Wu and Yu (Vol. 1), 2012, p. 191-192). 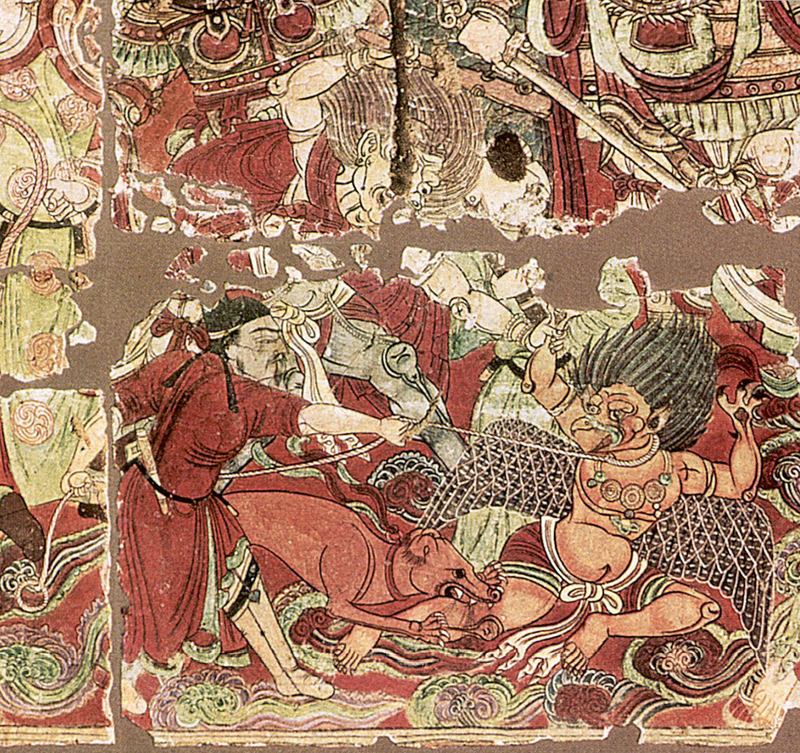 Monkey defeats the celestial army, along with the Heavenly Kings, prior to being subdued (Wu and Yu (Vol. 1), 2012, p. 172). And later the guardians “ben[d] low to bow to him and dare not bar his way” when he visits heaven some centuries after his rebellion (Wu and Yu (Vol. 4), 2012, p. 118). Beer, R. (2003). The handbook of Tibetan Buddhist symbols. Chicago, Illinois: Shambhala. Elgood, H. (1999). 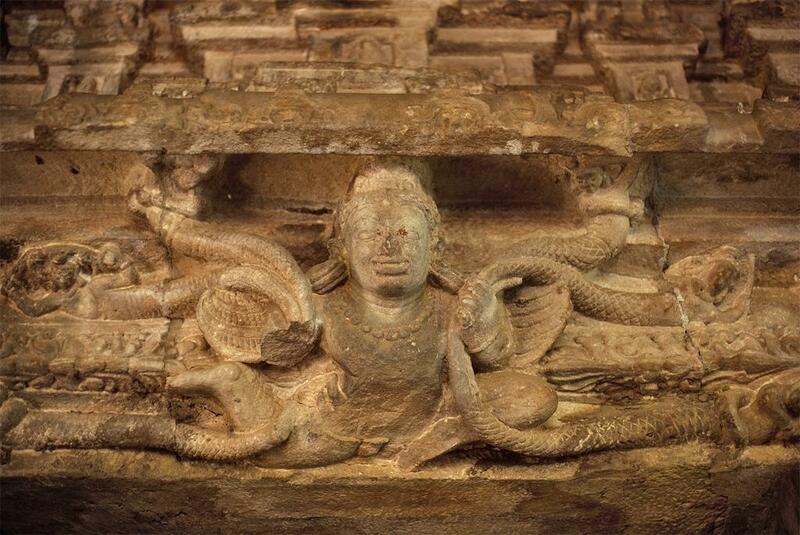 Hinduism and the religious arts. London, u.a. : Cassell. Orzech, C. D., Sorensen, H. H., & Payne, R. K. (2011). 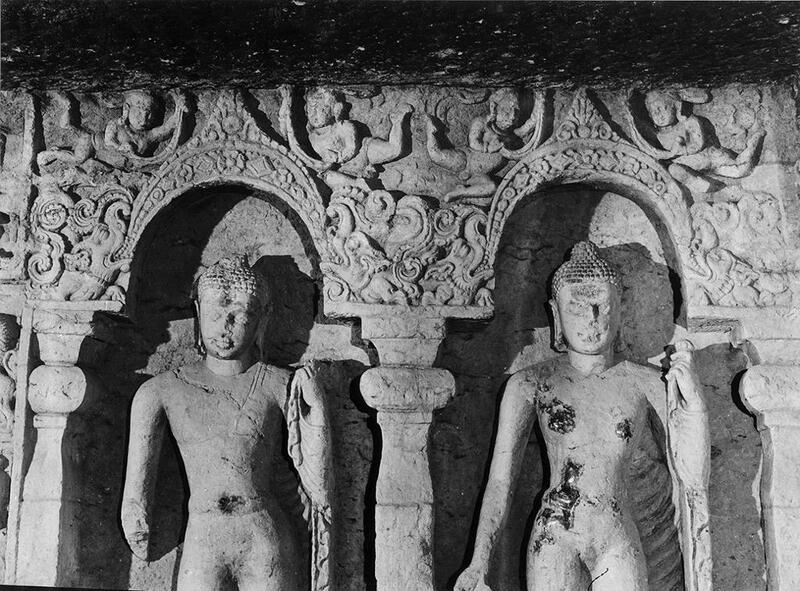 Esoteric Buddhism and the tantras in East Asia. Leiden: Brill. MacDonell, A. A., & Keith, A. B. (1995). Vedic index of names and subjects. Delhi: Motilal Banarsidass. Wu, C., & Yu, A. C. (2012). The journey to the West (Vols. 1-4). Chicago, Illinois : University of Chicago Press. The novel depicts Zhu Bajie as a reincarnation of the Marshal of the Heavenly Reeds (Tianpeng Yuanshuai, 天蓬元帥) (Wu & Yu, 2012, p. 212). But did you know that this general was actually venerated as a deity? His very name suggests the god can be traced to early shamanistic beliefs about magico-religious medicine, for a better translation of Heavenly Reeds is “Heaven’s Mugwort”. Van Glahn (2004) explains this “curious name…alludes to the plant’s demonifugic properties” (p. 121). This suggests the ancient belief that mugwort exorcised demons/illnesses was eventually anthropomorphized and deified as the general. Sui Dynasty (581-618) sources describe him serving under the Northern Emperor (Beidi, 北帝), the Hades of Daoism, as a powerful exorcist. This is best exemplified by the “Northern Emperor’s Method of Killing Demons” (Beidi shagui zhi fa, 北帝殺鬼之法), a sixth-century rite which contains a prayer invoking Tianpeng by name (Davis, 2001, p. 75; Pregadio, 2008, p. 979). Another text identifies him as one of nine stellar gods associated with the Big Dipper constellation and “assign[s him] the function of security and protection” (Davis, 2001, p. 75; see also Andersen, 1989, pp. 35-36). 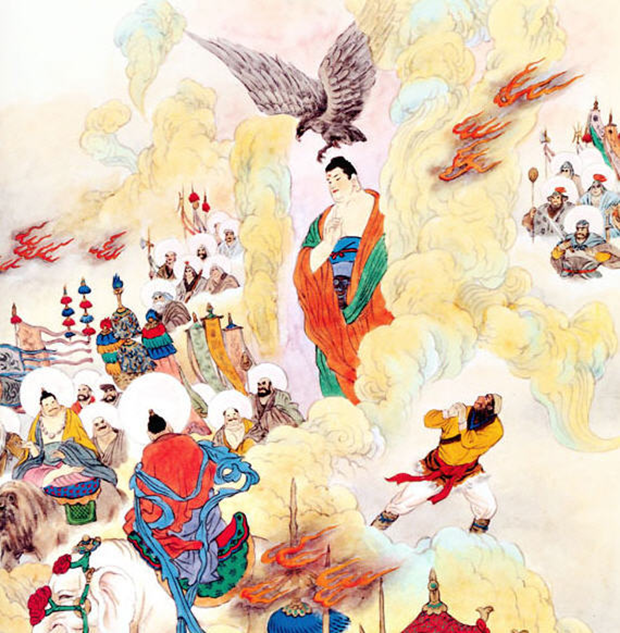 Early Song Dynasty (960-1279) sources expand on Heavenly Reed’s position under the Northern Emperor and describe him as head of the thirty-six generals of the Department of Exorcism (Pregadio, 2008, p. 992). 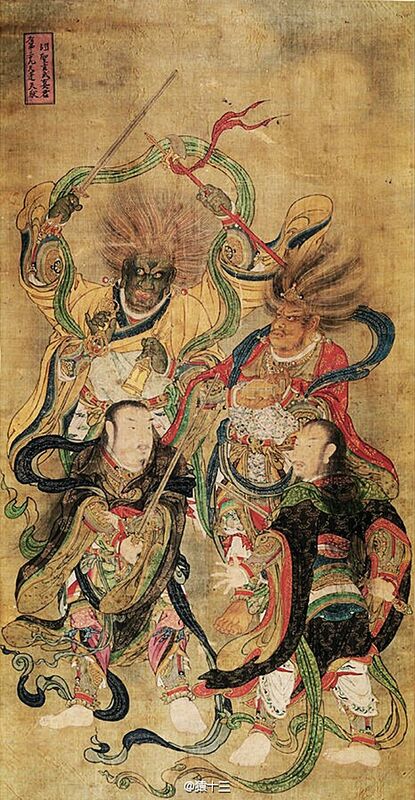 Most importantly, this is when he was associated with two other powerful exorcist deities, namely Black Killer (Heisha, 黑煞) and Dark Warrior (Xuanwu, 玄武), to form the trinity of the “Three Great Generals of Heaven” (Davis, 2001, p. 75). This was later expanded to a quaternity known as the “Four Saints” (Sisheng, 四聖), which included Heavenly Reed, Black Killer, the True Martial God (Zhenwu, 真武, a variant of the Dark Warrior), and Heavenly Scheme (Tianyou, 天猷) (Pregadio, 2008, p. 479; Little, Eichman, & Ebrey, 2000, p. 298). Tianpeng‘s position as a protector and association with the military led to his worship by soldiers. Davis (2001) writes, “The cult of Tianpeng remained popular among military circles into the Southern Song, when [legend has it] he aided various generals in their battles with the Jin” (p. 75). The Song also happened to be when he was bestowed the military rank of Marshal (Yuanshuai, 元帥) (Pregadio, 2008, p. 979), the name by which he is called in Journey to the West. 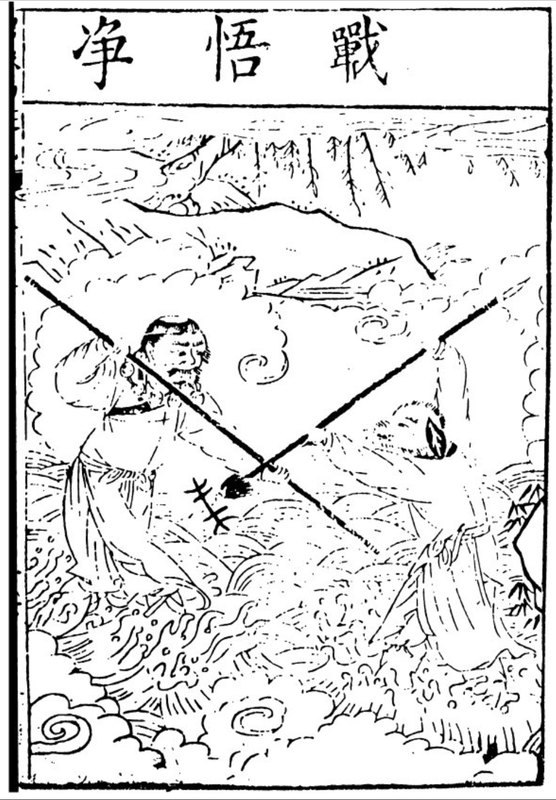 During the Ming, a martial arts style (Tianpeng’s Fork, 天蓬釵) and a weapon technique (Tianpeng’s Spade, 天蓬鏟) were named in his honor. Tianpeng is described in one Song dynasty source as a multi-armed god “dressed in black clothes and a dark hat” (Davis, 2001, p. 75). The names of his trinity companions also reveal their connection with black (i.e, “Black Killer” and “Dark Warrior”). This is because the color is associated with the direction north and thereby the Northern Emperor, whom the three serve (Davis, 2001, p. 75; Welch, 2008, p. 223). A circa 1460 painting of the aforementioned Four Saints actually portrays the Marshal of Heavenly Reeds with black Skin (fig. 1). Why is this important? Because Journey to the West describes Pigsy as having a black face (Wu & Yu, 2012, p. 375, for example). 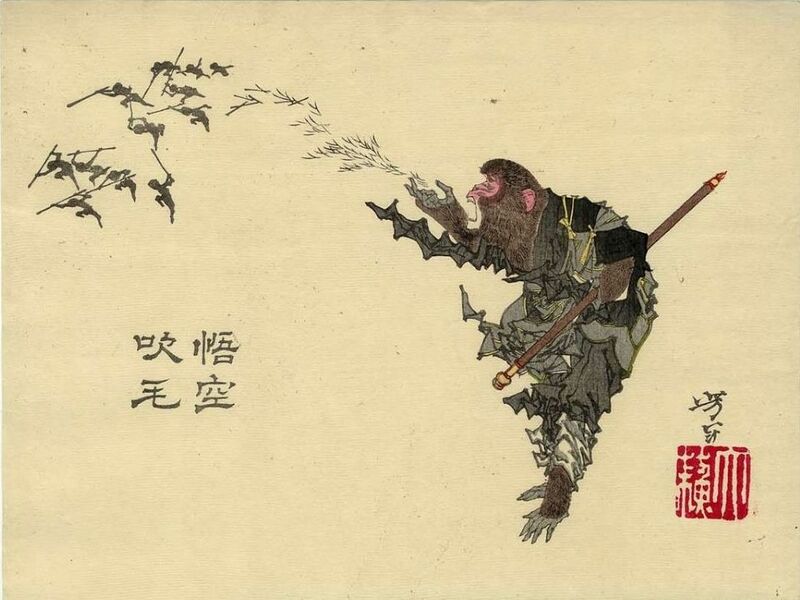 I therefore suggest Zhu Bajie is described as such because of his previous incarnation’s association with the color. Fig. 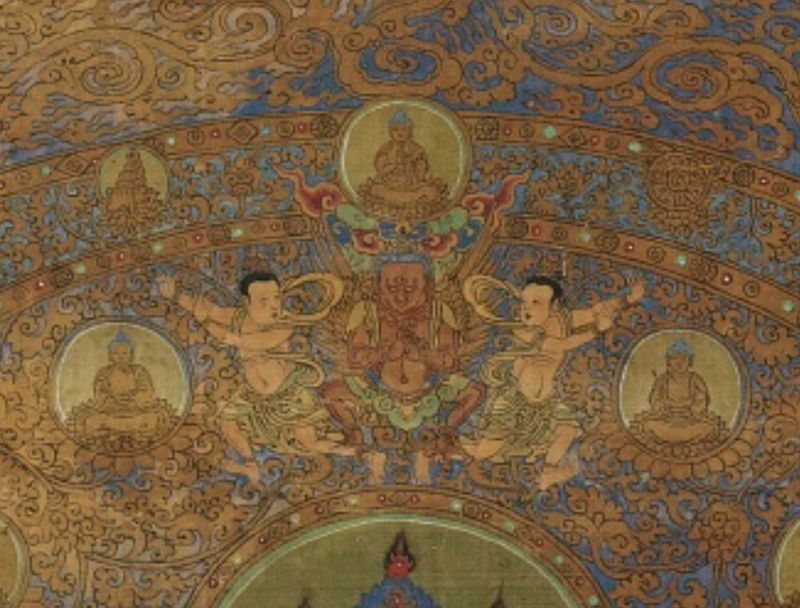 1 – (Left) The circa 1460 painting depicting the Four Saints (Sisheng, 四聖) (larger version). 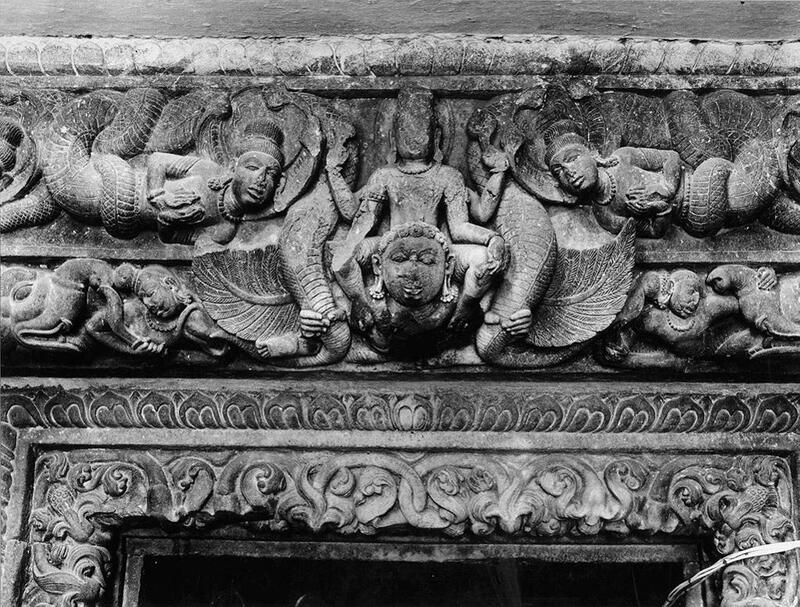 Heavenly Reed is the black-skinned figure in the upper left. Fig. 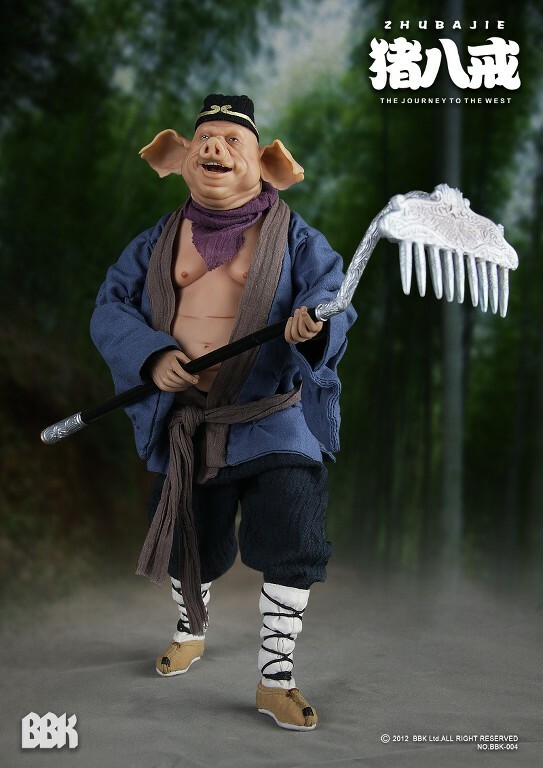 2 – (Center Left) A modern Zhu Bajie action figure with an ornate silver-headed rake (larger version). Fig. 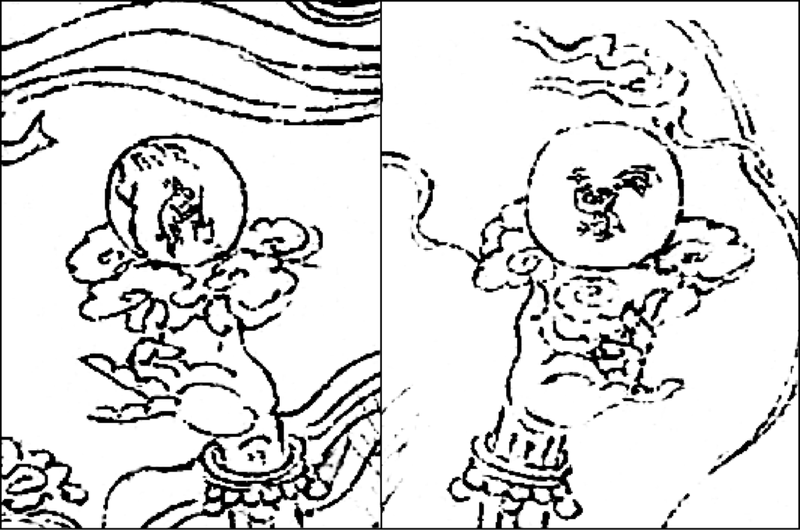 3 – (Center Right) A pair of Pa (鈀) military rakes from the San Cai Tu Hui (三才圖會, 1609) (larger version). Fig. 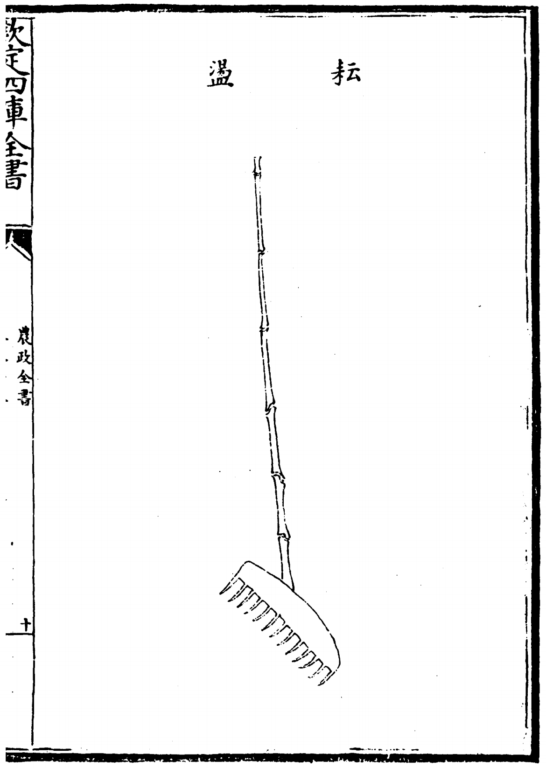 4 – (Right) A Yundang (耘盪, hand harrow) from a Ming Dynasty agricultural treatise that borrows heavily from the Nongshu (農書) (larger version). JTTW describes Pigsy’s rake as being a polearm with nine teeth (fig. 2). But did you know that, despite serving as a general in heaven, his weapon is not the kind that was historically used by the Chinese military. Those of the Ming Dynasty (1368-1644), when the book was written, “were [two] meters in length and used to unseat enemy riders and hook and grab enemy weapons” (Swope, 2009, p. 78). The Pa (鈀, rake) (fig. 3), for example, was covered with hooks in place of teeth to aid in the aforementioned hooking action. But noted Ming General Qi Jiguang (戚繼光, 1528-1588) considered it useless in his battle against Japanese pirates (Tang Pa (钂鈀), 2015). 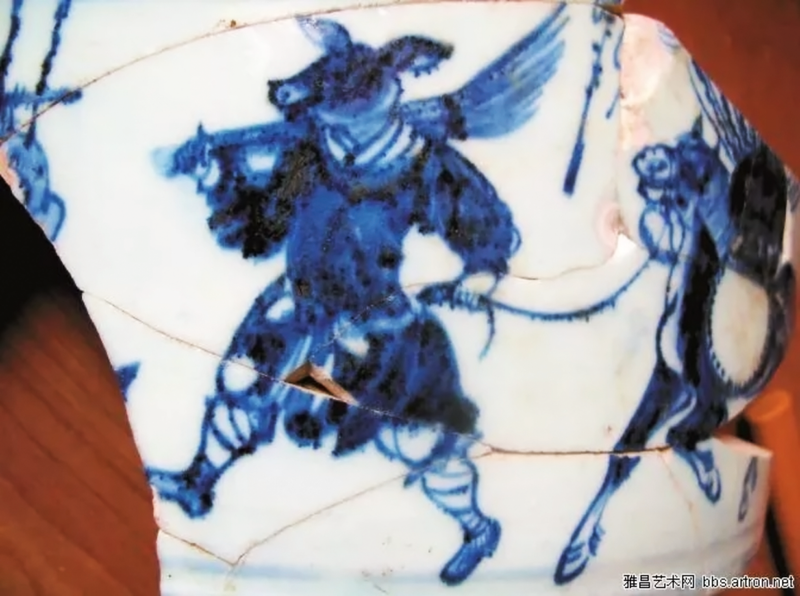 Pigsy’s weapon more closely resembles agricultural tools that were traditionally used by peasant farmers as far back as the Yuan Dynasty (1271-1368). The Book of Agriculture (Nongshu, 農書, 1313) by the Confucian scholar and inventor Wang Zhen (王禎, fl. 1290-1333) includes descriptions and woodblock prints of several manual and water-powered farming implements. The book itself was written in response to the devastation that the Mongols had wrought on China over decades of war. So the featured tools were meant to help make life easier for farmers toiling away in the fields (Bray & Needham, 2004, pp. 59-60). One such innovation to come from the book was the Yundang (耘盪, hand harrow) (fig. 4), a bamboo-handled rake with metal teeth designed to weed rice crops (Bray & Needham, 2004, pp. 61-62). I suggest this and other tools like it most likely influenced Zhu Bajie’s weapon. I also posit the hog spirit was given such a weapon because it added to his image as a country bumpkin. Whereas Monkey wields a magic iron staff once used by Yu the Great to tame the world flood, Pigsy brandishes a gardening tool. The weapon itself is comical in that it is said to have been handcrafted by Laozi (老子) from “divine ice steel” and etched with arcane symbols (Wu & Yu, 2012, pp. 382-383). That’s one fancy rake! Feng Dajian of Nankai University was kind enough to direct me to this Ming-era woodblock print (fig. 5) by Shide tang (世德堂本), the original publisher of Journey to the West. Check out Pigsy’s war rake! Again, his weapon from the novel is the agricultural type, but this print is an interesting change of pace. Also, notice how Sandy’s staff doesn’t have any metal blades (as normally shown in pop culture). Fig. 5 – Ming-era Shide tang print of Pigsy vs Sandy (larger version). A beautiful rendering of Marshal Tianpeng (fig. 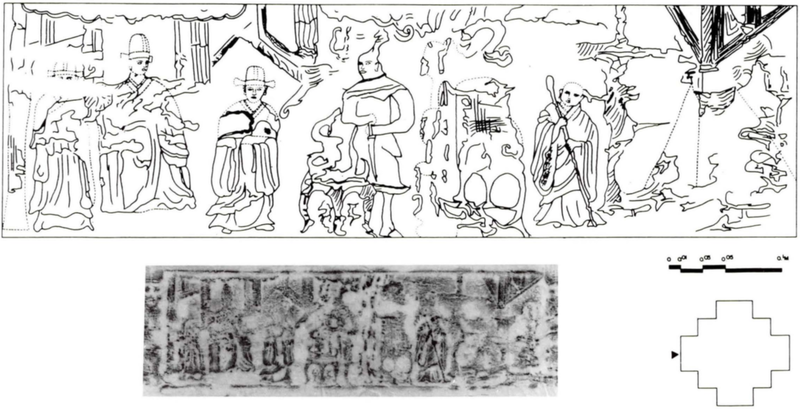 6) appears in the Ink treasures of [Wu] Daozi (Daozi mobao, 道子墨寶), a collection of ink drawings traditionally attributed to the noted 7th/8th-century artist Wu Daozi but likely hails from the 13th-century. 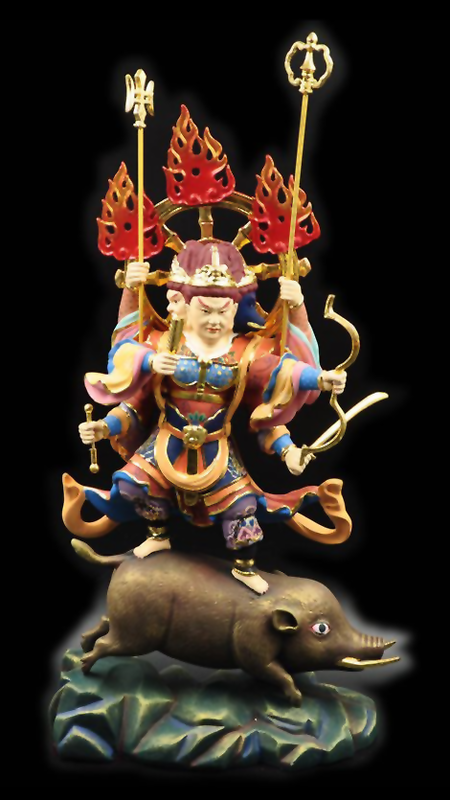 Tianpeng is portrayed as an esoteric protector deity with multiple arms holding implements of both war and religion. The military arms include a halberd and a sword, while the religious items include a vajra bell, a mirror, and two orbs adorned with a rabbit and a rooster, respectively (fig. 7). 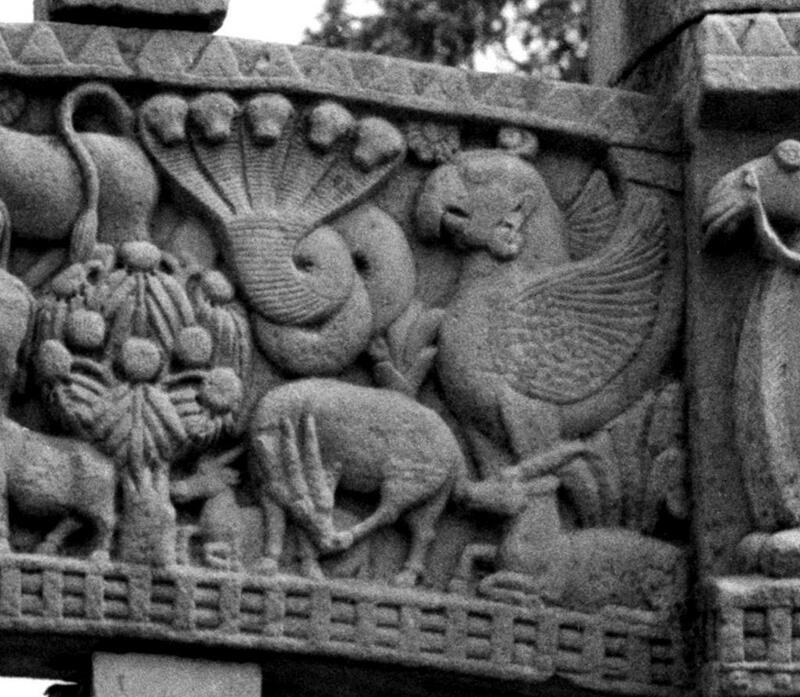 These animals represent the moon and the sun, being zoomorphic symbols of yin and yang forces. 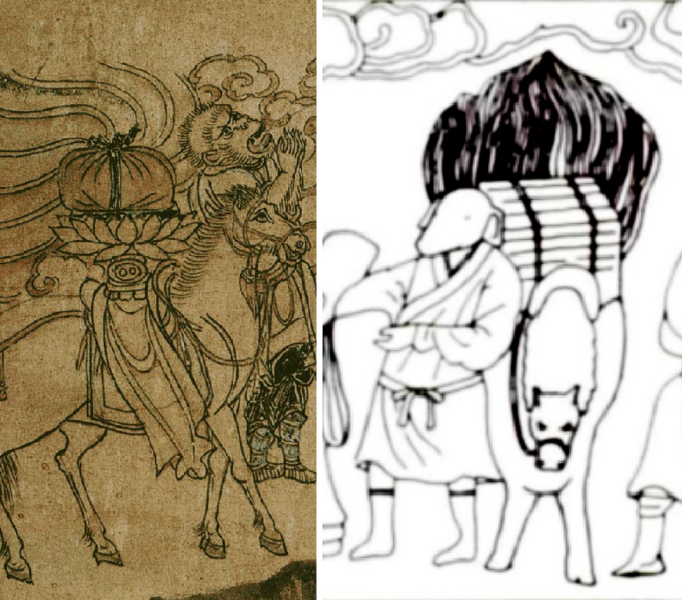 Interestingly, the rabbit is seen mixing the elixir of immortality, a common motif in Chinese art (fig. 8). Fig. 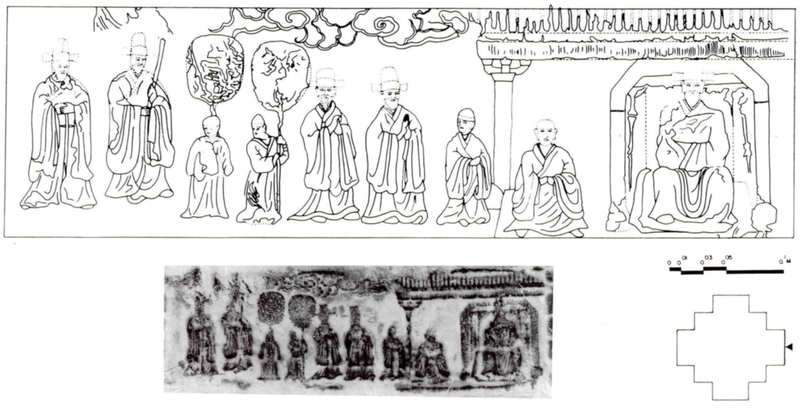 6 – Tianpeng from the 13th-century Ink Treasures of Wu Daozi (larger version). The original drawing can be seen here. Fig. 7 – Details of the Moon Rabbit and Sun Rooster (larger version). Fig. 8 – The Moon Rabbit motif from an 18th-century court robe (larger version). What’s most interesting to me about the drawing is the obvious esoteric Buddhist influence. 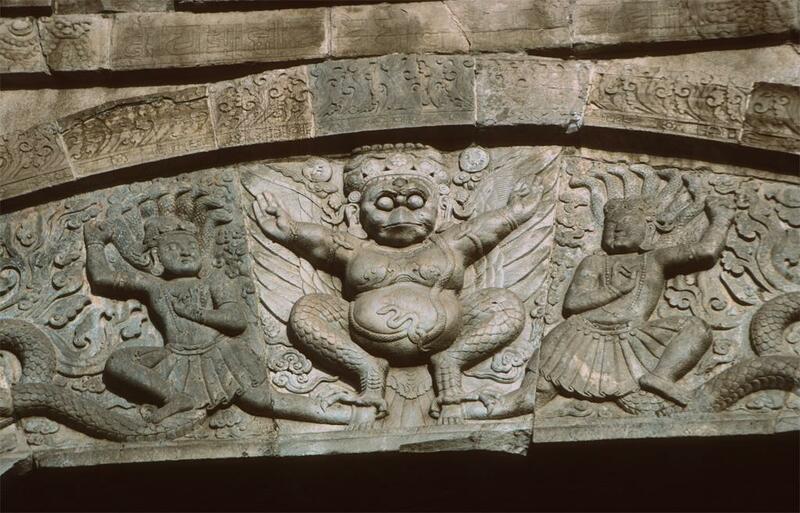 In this article I mention a 13th-century stone relief carving of Sun Wukong in which he is portrayed with a headband, arm ornaments, bangles, a bone rosary, a girdle, a tiger skin apron, and anklets. 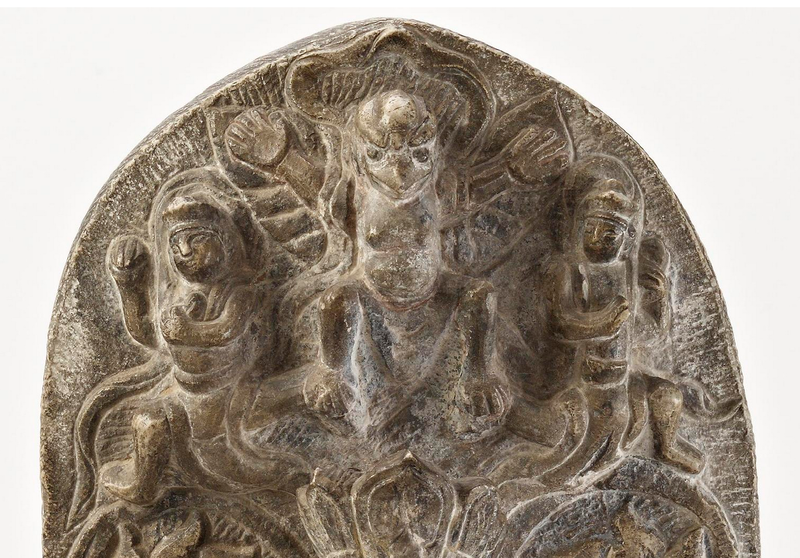 These items are listed among an 8th-century source as ritual adornments worn by Buddhist yogis, each one representing a different esoteric Buddha or philosophical aspect of the religion. Many of these same ritual items appear on Tianpeng, pointing to a borrowing of esoteric Buddhist motifs by Daoism. 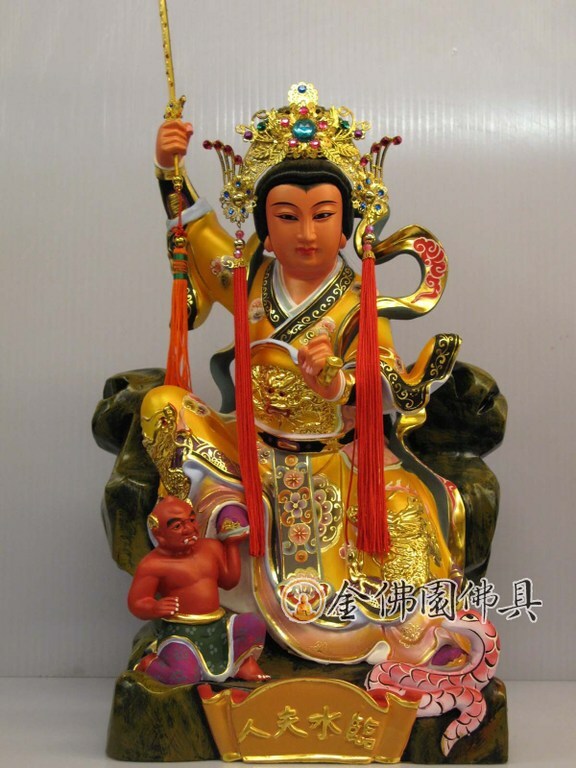 Brose (2018) suggests Zhu Bajie may ultimately be based on an esoteric Buddhist sun goddess worshiped in China known as Marici (Molizhi, 摩利支), or Doumu (斗母/斗姆, “Mother of the Dipper”) in Daoism,  who is often depicted as a fearsome, multi-armed guardian astride a boar or aloft a boar-driven chariot, and among whose multiple faces is a boar (fig. 9). This is because a stage play that predates the Ming novel represents Pigsy as the goddess’ mount come to earth (Brose, 2018, p. 174). This would mean Zhu Bajie’s connection to Marshal Tianpeng is a later addition to the story cycle. Both Tianpeng and Marici are associated with the stellar bodies of the Big Dipper constellation and share similar exorcistic duties (Brose, 2018, pp 175-176). This may explain why Pigsy was later associated with the general. Fig. 9 – A modern altar statue showing Marici’s martial aspect riding a boar (larger version). Take note of the boar-like face on the right. Regarding the origin of Marici’s boars, Getty (1988) explains Riksha, the Sanskrit word used to denote the bright stars of the Big Dipper, sounds just like the term for bear. Therefore, one hypothesis states this confusion may have resulted in the sun goddess’ mount being a bear, but due to the scarcity of the animal in South Asia—or just plain iconographic confusion, in my opinion, since both animals are dark-furred quadrupeds—the iconography was changed to a boar over time. If true, this means Zhu Bajie could have been a bear! 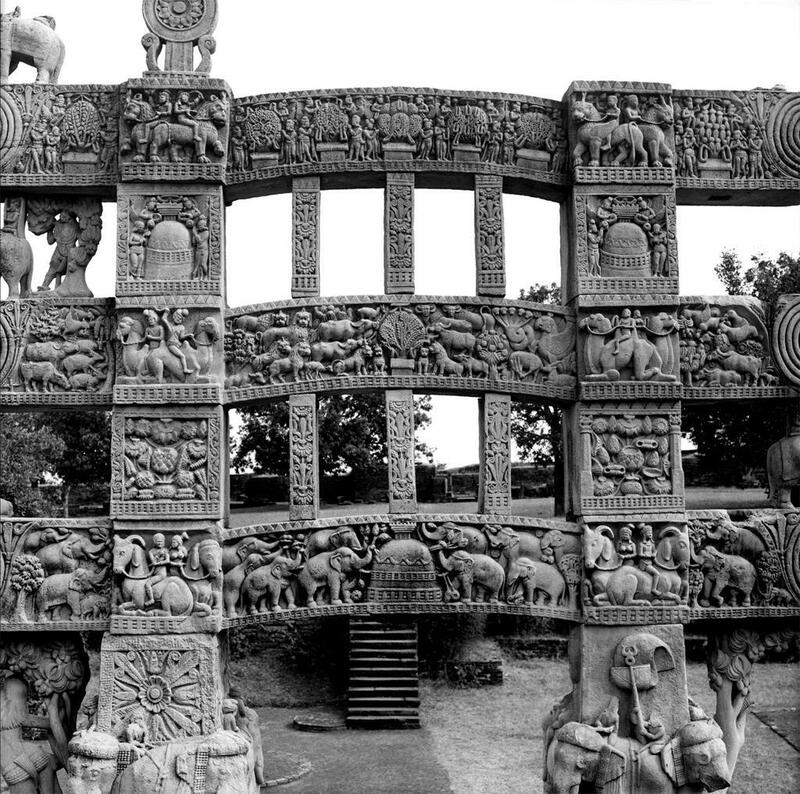 Furthermore, the seven boars shown to be pulling her chariot in some religious art are most likely based on the seven steeds of the Hindu sun god, Surya (pp. 117-118). 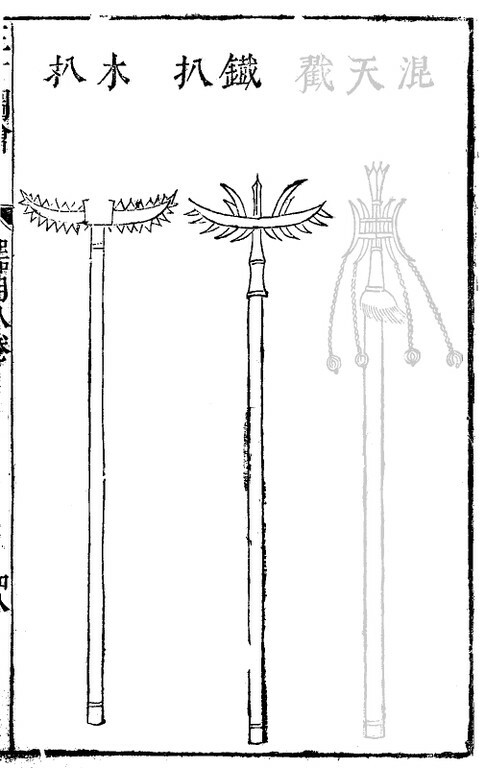 1) Other kinds of military rakes included the pitchfork-like Yi Pa (㑥耙), the trident-like Tang (钂) and Tangpa (钂鈀), and the more rare halberd-like Mao Lian Tang (茅鐮钂) (Tang Pa (钂鈀), 2015). 2) For information on Marici, see Getty (1988), pp. 117-119. For Doumu, see Esposito, 2008, pp. 282-283. Bray, F. & Needham, J. (2004). Science and civilisation in China: Volume 6, biology and biological technology; part 2 – agriculture. Cambridge: Cambridge U.P. Davis, E. L. (2001). Society and the supernatural in Song China. Honolulu: Univ. of Hawaií Press. Getty, A. (1988). 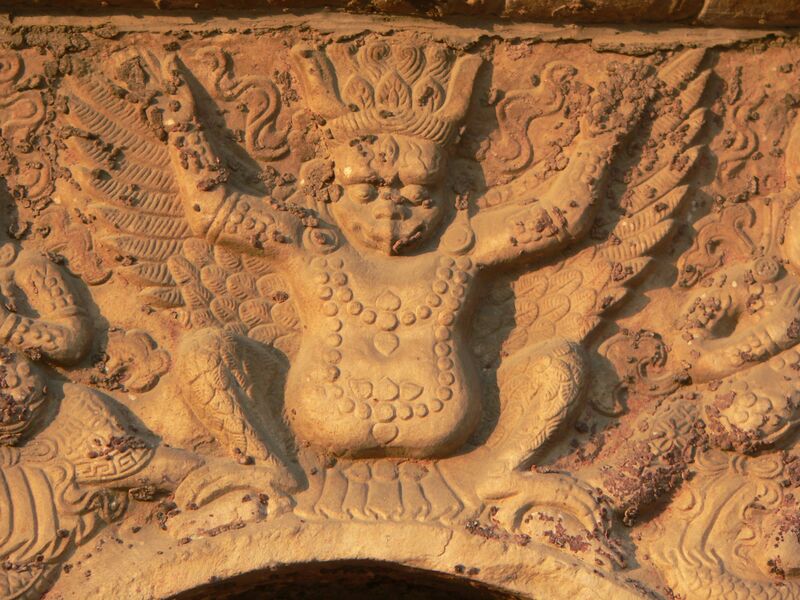 The gods of northern Buddhism: Their history and iconography. New York: Dover Publications. Pregadio, F. (2008). The encyclopedia of Taoism: Volumes 1 and 2. London [u.a. : Routledge. Swope, K. (2009). 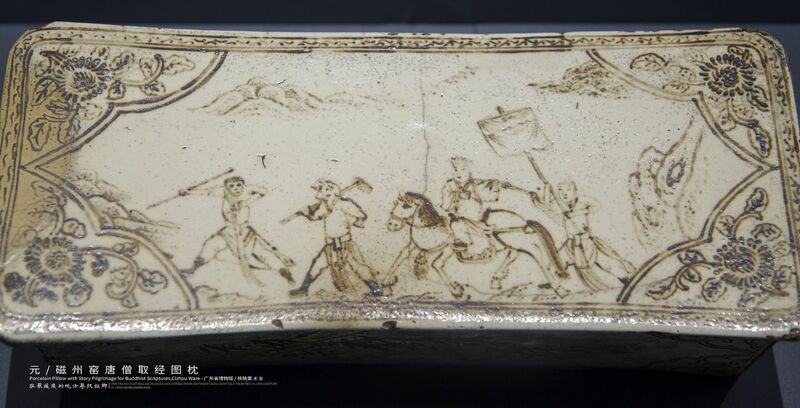 A dragon’s head and a serpent’s tail: Ming China and the first great East Asian war, 1592-1598. Norman: University of Oklahoma Press. Von, G. R. (2004). 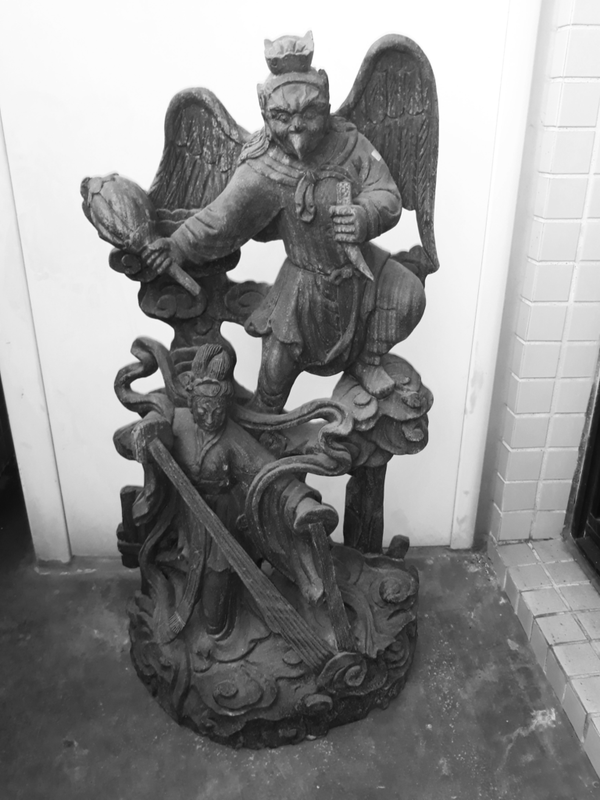 The sinister way: The divine and the demonic in Chinese religious culture. Berkeley: University of California Press. Welch, P. B. (2008). 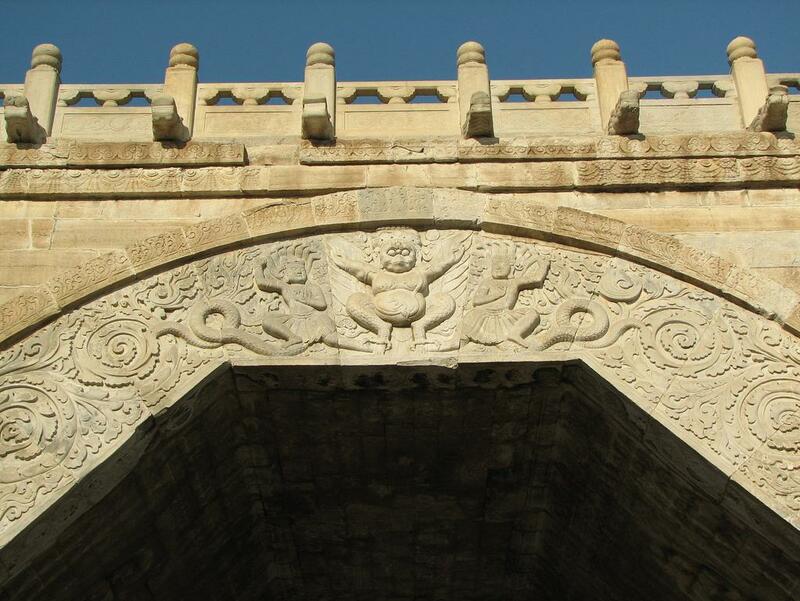 Chinese art: A guide to motifs and visual imagery. North Clarendon, VT: Tuttle Pub.